Have you ever driven up behind a school bus and been a little confused about how to safety proceed? With 265,000 Alberta students riding school buses each day, it's essential that people understand the safest way to approach a school bus. When approaching a school bus for the first time, do so with caution. Kids who are late for the bus could run in front of your vehicle. Alternately, kids who just got off the bus could be in a hurry to get home and may not be looking at traffic. 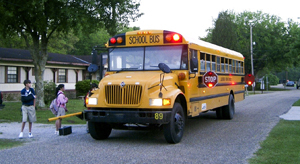 Flashing lights: If a school bus has activated its flashing lights you must stop, regardless of whether you are approaching an oncoming bus or following one. The only exception is if you are approaching or following a school bus that is on a two-way divided highway with a median. You are able to proceed only when the bus' red lights stop flashing. Be sure to drive cautiously, as children who have just left the bus may try to cross the street without warning. No flashing lights: If the bus is not flashing its lights, proceed slowly and cautiously as children can quickly dart into traffic without warning. Keeping these rules in mind will help to ensure that Alberta's schoolchildren are safe. You will also avoid the understandably expensive ticket you will receive for ignoring the school bus' flashing lights: a fine of $402 and six demerit points. A ticket of this kind will also likely affect your insurance, so remember these rules and put them into practice!